People like Youtube that cause everyone can make video to show whole the world, even you do not have a professional camera and photographic skill, your video is still possible in popular if people like see it. If I say Foodtube, maybe you can guess that talk about food video. Yes, you got it. 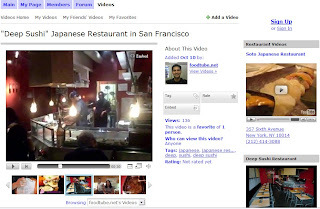 Foodtube is an online video community site, the features are same Youtube, subject only for food and drink. You can discover different food, cooking, video recipes, or restaurant by sorts. Of course, you can submit your food video to this site if you join this community. Pretty interesting. I really think maybe I will make a cooking video one day, and submit it onto this site, I will have my own food channel.